FourEyedPride.com member Jarret Ralton, known on our forums as jaz50, has been a part of our community since 2005. 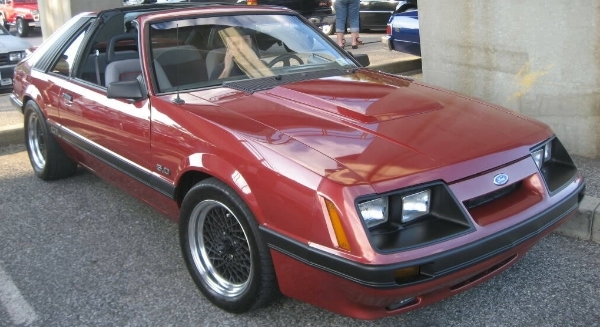 Jarret’s search for his ’85 Mustang took a very long time to find that perfect four-eye that he now owns. The search began in early 2000, when at the time he had a high mileage Mercury Capri as his daily driver. Due to ever changing daily life and a move to a new apartment, Jarret sold his trusty Capri to help save money on gas and tolls during his daily commute. But, as you can see, Jarret didn’t lose his love and passion for Four Eyed Foxes! His search began in earnest for a Mustang coupe, but after several months of unsuccessful coupe hunting, Jarret came upon a 1985 Mustang GT in the local classifieds. A quick trip to check it out resulted in meeting both previous owners of this fine car and being able to discuss its 31,000 mile life in great detail. After taking the requisite test ride, Jarret was sold and purchased the GT the very next morning. Although this GT was no longer stock when Jarret purchased it, he continues to tweak, tune, and modify this Mustang to his dreams and desires. The list of modifications is extensive and impressive. So here we go with all the details! The almost-stock exterior has been treated to a repaint in the original Medium Canyon Red Metallic. All the original gray trim and moldings have been repainted in black to compliment the Canyon Red paint. The hood has the added feature of an 83 GT hood scoop that is now functional to help feed all the horsepower under that stock hood. The Mustang rides on a set of Black Riken 16” X 7” wheels shod with Nitto 555R 245/50/16 tires that complete the look so similar to the Saleens of the 80’s which was just what Jarret was going for. The interior is stock ’85 Mustang GT with the awesome GT seats in two-tone gray with red piping. Thanks to the excellent care of its owners the interior is in mint condition and appears to have just rolled off the dealer’s lot! Jarret did add a set of drilled aluminum pedal covers and a Hurst Competition Short Throw Shifter & UPR shift stem to add a personal touch, but otherwise the Ford engineers got it right back in ’85 and it’s a tough job to improve upon. Now, under the hood is where the magic and all the real modifications start. 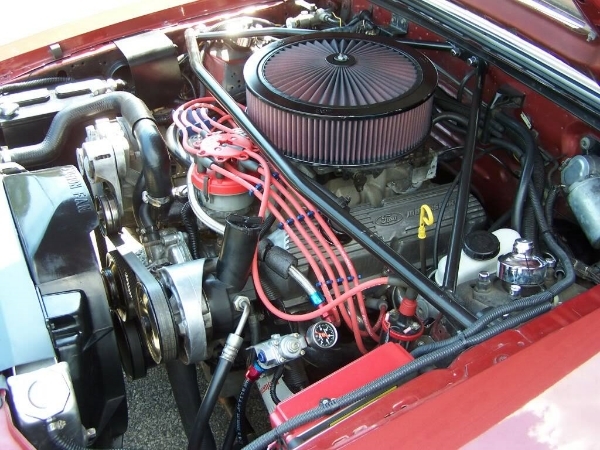 The 302 has been treated to Ford Motorsport J302 cylinder heads, Ford Motorsport 1.6 roller rockers, Steeda #19 camshaft, Ford Racing aluminum intake manifold, Edelbrock 650 Thunder Series four-barrel carburetor, K&N air filter; A/C delete kit, MSD 6AL ignition control box, MSD Blaster 2 coil, and JBA 1 3/4" shorty headers that flow through UPR 2 1/2" X-type mid-pipe, Borla 2 1/2" mufflers and tips. All those ponies are routed through a T5 that has been upgraded with Ford Racing 10.5" King Cobra clutch, pressure plate and aluminum flywheel. The power is finally pounded into the pavement through an aluminum driveshaft mated to the upgraded 8.8 with Ford Racing 3.73 gears. The suspension has seen its fair share of upgrades and modifications, too. This includes subframe connectors, strut tower brace, Maximum Motorsports rear lower control arms, Eibach Pro lowering springs, and Koni Red Adjustable struts/shocks. Jarret also upgraded to 1989 GT front spindles and brakes as well as a rear disc brake conversion complete with adjustable brake proportioning valve and braided stainless steel lines. Over the past 6 years of ownership Jarret has rolled the odometer over to the tune of 58,000 miles, which has enabled Jarret to truly enjoy his Mustang and prove that despite its great looks it’s definitely no trailer queen. The GT was featured in Modified Mustangs & Fords back in 2007, in addition it has accumulated a few show trophies, but for Jarret the joy of ownership is more about hanging out with the great people you meet at shows, cruise nights, and online forums such as FEP. Jarret still has future plans for the ’85, so with some late nights in the garage and an understanding wife I am sure he will be able take this GT to the next level. That's awesome, Jarret!!! Happy for ya, bud!! Congrats!! Congrats Jarret! Beautiful car. I really like those wheels. Saw this car a few weekends ago. Very impressive. Congrats! Very nice example of what I would do to my 85 if I wasn't dedicated to staying close to original since it is a limited edition. That's a beautiful clean car! Congrats! Well deserved Jarret! Performs as well as it looks too.